We are loving the new design of Monkey Balm! We were recently send one for review and the new packaging is so adorable, and the KIDS love it! Monkey Blam has been our go-to product for skin care needs since my son first broke out in hives. When I asked around, my mom group suggested Monkey Balm! I was so lucky because later that week I saw it on Babysteals.com and I stocked up. Since then, we have never been without 2-3 tubes in our home! My husband, daughter, and son all use it. We have used to to treat eczema, hives, and even the occasional scrape! It works wonders on really chapped hands during the winter, and especially dry noses! 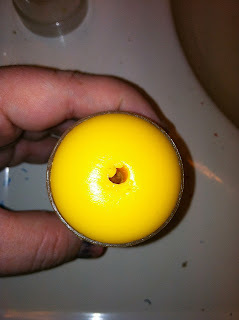 SeaBuckthorn is the main ingredient and it is incredibly soothing to dry and irritated skin! 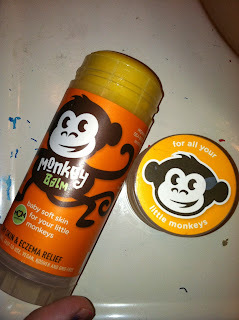 MamaBreak received Monkey Balm to review here on the site. We did not receive any other kind of compensation. As always, our opinions and experiences are our own. My older son has eczema, and his skin gets very chapped in winter. He'd definitely be using it the most. my little guy...he has eczema & his skin gets very red & chapped all the time! Me, for my eczema on hands & feet. My hands get extremely dry and sore in the winter and my daughter gets really dry skin all over in the fall/winter so we could both really benefit from this, thanks for the giveaway! I would like to try it for my son's eczema. My son just had 2 horrible cases of hives and would have appreciated something to make him feel better. My 3 years old boy!! Sounds like we all need it if we live with boys, thanks for the offer Jo and Steph! Just wish I was a part of tweeting, just got too much going on to add that part in. My grandsons need it when the visit!!! My grandson and I need the Monkey Balm the most due to our fair skin. You may post on mobile skin the customer service for the blog. You could advertise it's tremendous. Your blog advice might expand your readers.